There is usually plenty to see and do as a Star Wars fan at San Diego Comic Con and this year was certainly no different. The Lucasfilm pavilion at SDCC has become home to various licensees over the years including Hallmark, Del Rey, Mimobot, Her Universe, Petco, and Topps to name a few. 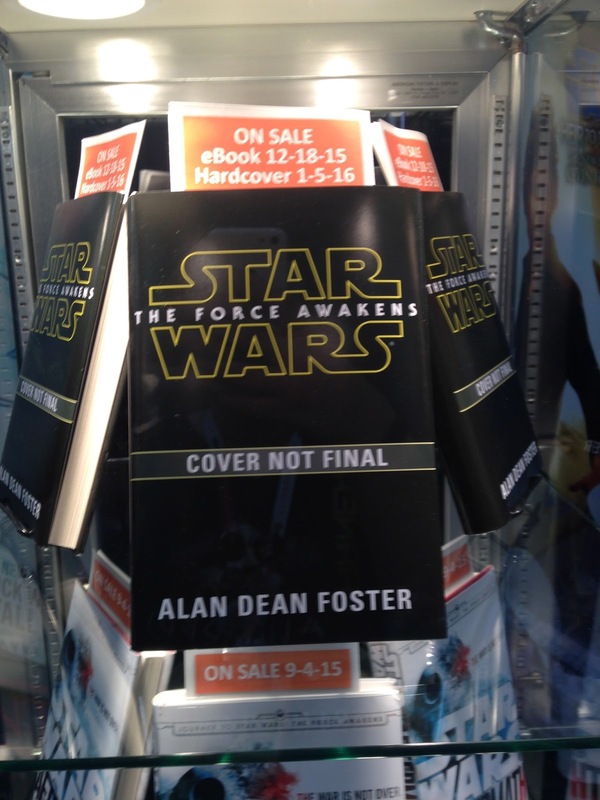 For fans anticipating new product from The Force Awakens there were plenty of teases. 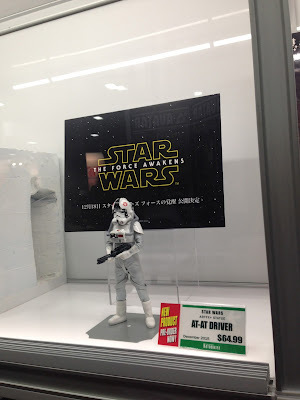 Following Revel's example of showing empty boxes at Toy Fair, other companies followed suit by showcasing placeholders for future announcements. 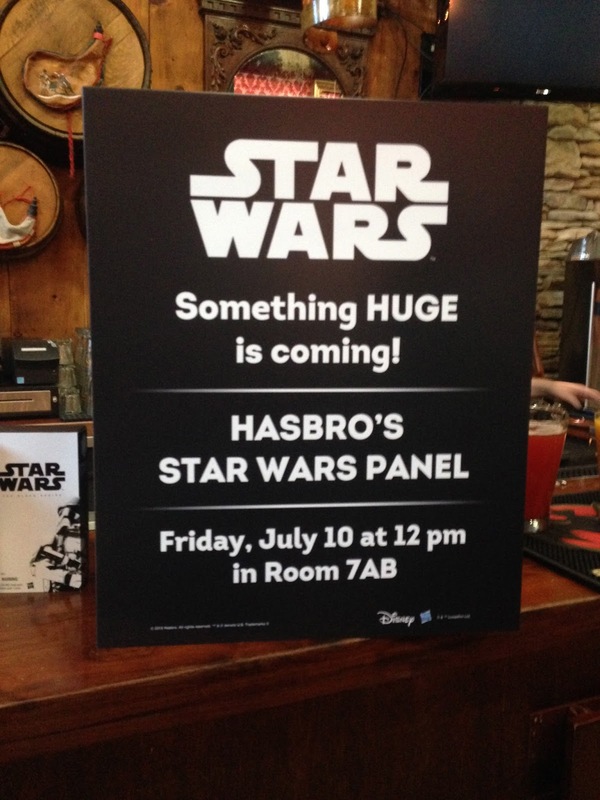 Hasbro had a large display case that would later be uncovered during the convention. At the Hasbro press breakfast, Thursday July 8th, they continued the tease with a giant box. Kotobukiya was sure to let fans know that lurking in the background of their current products, new models were coming. Del Ray displayed a placeholder The Force Awakens book. For those hoping to spoil the movie, you'll have to wait until the day of the film's release to read this one. 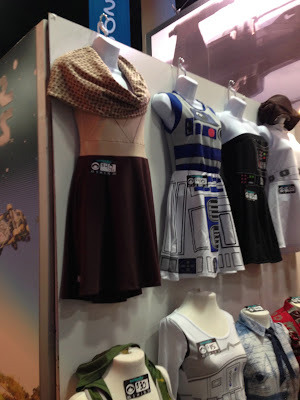 For those looking to purchase The Force Awakens merchandise, We Love Fine had one of the few items available for sale on the show floor, a 'mechanic' dress inspired by the character Rey. 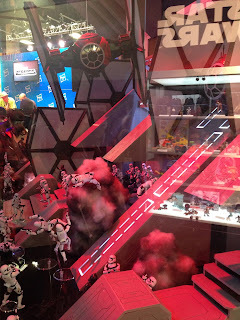 Hasbro sold their The Force Awakens "First Order" Stormtrooper at their booth which promptly sold out before the show was over. Licensed BB-8 items were nowhere to be seen. That was another story in artists alley where Ashleigh Popplewell, Heather Pryor, and Ninja Robot all had something for collectors. Beyond the show floor there were panels a plenty on 'Star Wars day' Friday at Comic Con. Toy licensees and high end collectible manufacturers introduced what product they could while remaining tight lipped about any product related to The Force Awakens. 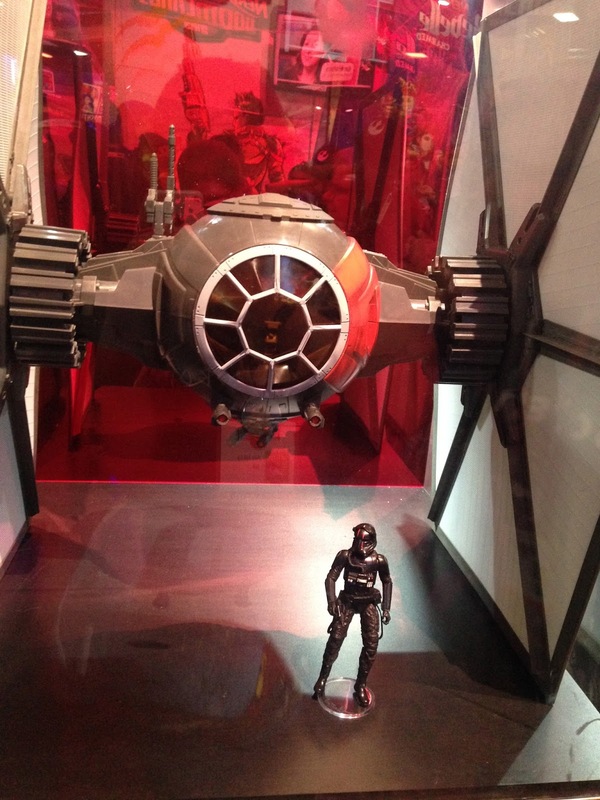 Hasbro finally revealed what was in their case on the show floor, a 6 inch scale Special Forces TIE Fighter, pilot, and diorama. The main event, the Lucasfilm panel in Hall H was just as much about celebrating the past as it was looking into the future. 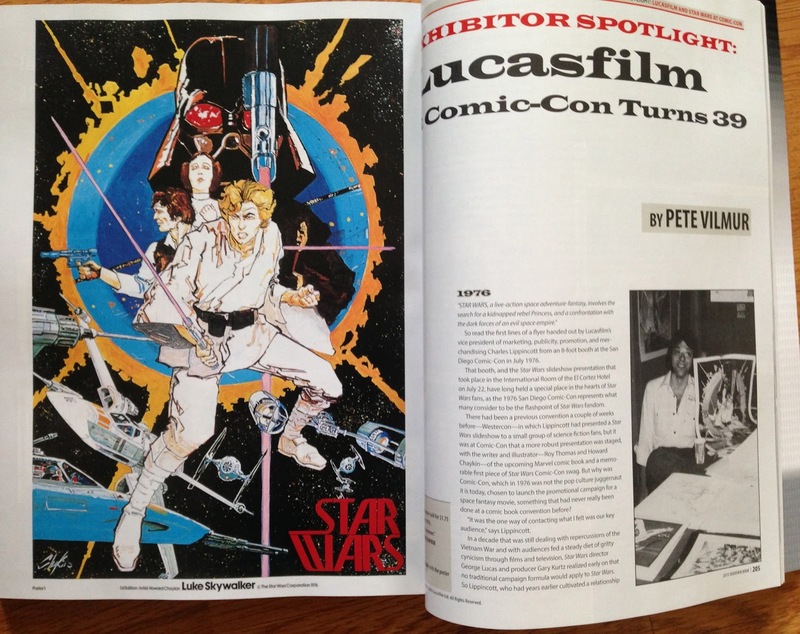 We were reminded that Star Wars was introduced at San Diego Comic Con at the very beginning in 1976. During the panel, fans were introduced to new Force Awakens characters as well as returning favorites. Some behind the scenes footage and images from the new film were shown. Mark Hamill got the opportunity to talk about bringing Star Wars to Comic Con in 1976. Directly following the panel there was an impromptu concert by the San Diego Symphony on the waterfront. The concert included all the actors from the panel. John Williams recorded a special introduction to fans and the night ended with a spectacular fireworks show. 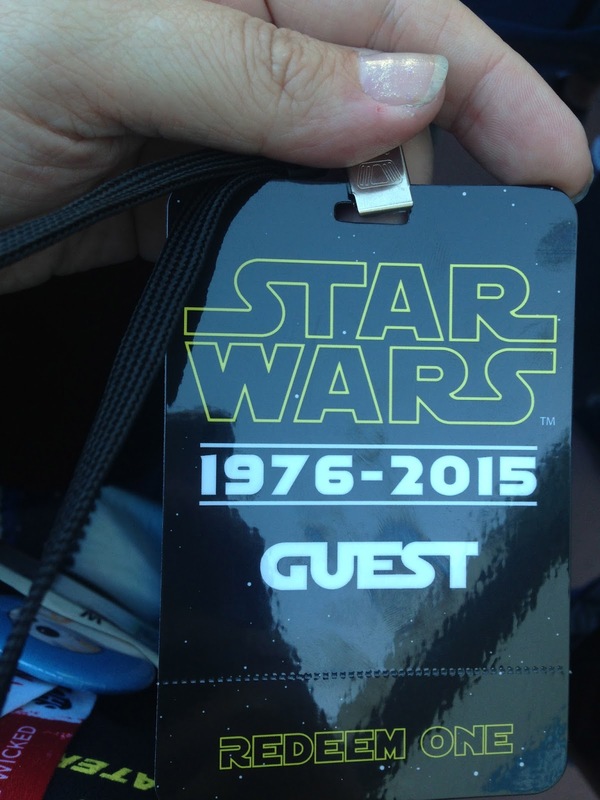 Every attendee got a badge and a lightsaber with the logo 'Star Wars 1976-2015' again reminding everyone of the relationship between San Diego Comic Con and Star Wars. 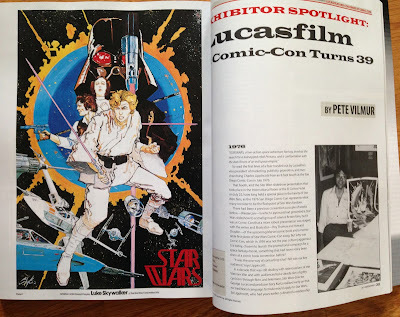 The Comic Con Souvenir book included a fantastic article from Lucasfilm's Pete Vilimur (also an editor here on the Star Wars Collectors Archive) highlighting the history of Star Wars at Comic Con. There were no posters by Howard Chaykin available to purchase for $1.75 at the Lucasfilm booth like there were in 1976, but for the lucky few at San Diego Comic Con 2015, we'll have memories to last a lifetime. With the 'Chive Cast returning to its regular show format following the live SWCA shows, we are back on the specific figure MarketWatch track. First up is the AT-AT Commander. Whilst not the most exciting figure, I did actually anticipate a bit more love for him that the market actually produced. As we move past the 41 back characters, the number of potential cardbacks we see him on reduces, with only 5 ESB cardback possibilities. Regular followers of the MW will know we're always on the lookout for coin offer MOCs, particularly those that have multiple offers and even multiple price stickers. AT-AT Commander didn't disappoint. Pricing was relatively low across all examples seen over the period. Perhaps this reflects that no high grade examples are coming up for auction. A few decent grade examples in the $300+ range were sitting as BIN auctions, but no takers. I actually didn't find any Kenner graded MOC's sold over the period ..... this was a first for these MarketWatch segments. We did find plenty of coin offer stickers, no surprise, as I'm sure he was a very good peg warmer back in the day. Interestingly, the market rate for the 2010 Vintage Collection MOC was in the $50-$75 range, this would be the first time I've seen those MOC's up with (and more than) the majority of sales data. (I actually found another similar cardback with coin offer that sold for $41). So there we have this month's selection. Not a lot of great examples, but it highlights that you can still buy some MOC's at pretty reasonable pricing. Till next month, Wampa Wampa!! 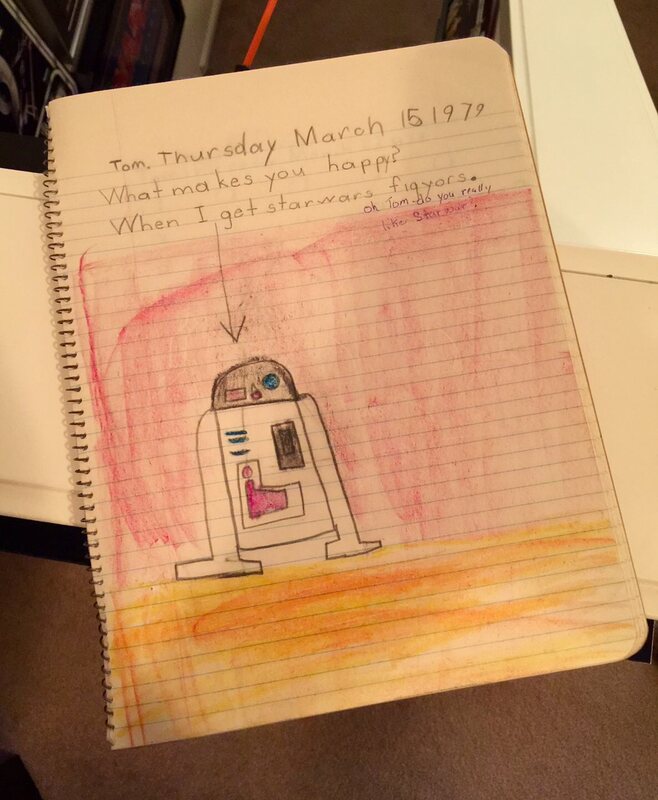 In a continuation of our look into the past through Star Wars scrapbooks, Part 2 covers that dreaded childhood task: homework. One unifying theme in these examples is turning a passion of Star Wars into actual homework assignments. Was it our fault that the teacher left broad guidelines as to allow for such free style writing? Tom Berges from I Grew Up Star Wars and Galaxy of Toys has shared his journal from second grade with us. He clearly chose the right notebook to write in. Flash forward to the spring of 1999 in my junior year of high school art class. The assignment was to do a sketch a day for homework. 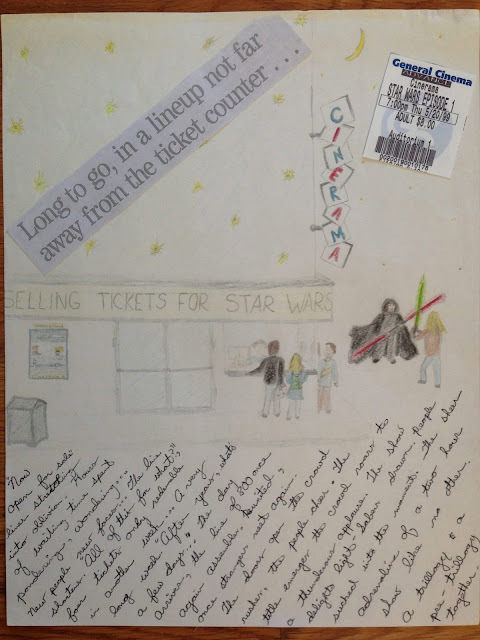 This collage completed the week Episode 1 came out includes the ticket stub, a headline from the Seattle Times, a sketch of the Cinerama theater, and a artsy recollection of my time in line. Collector Earl Bergquist, submitted this assignment from his nephew Albin (age 7). 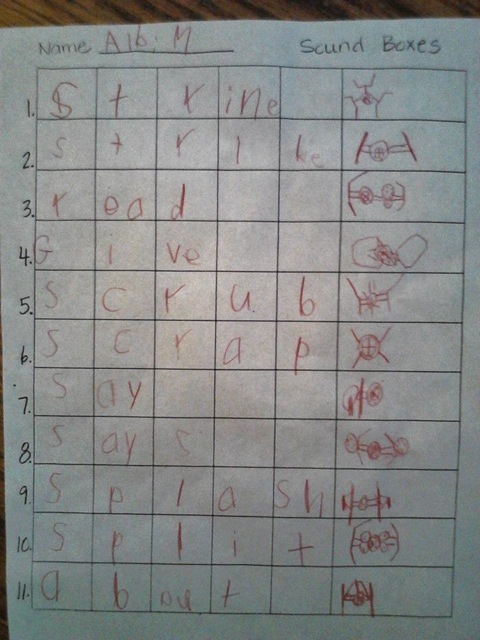 Instead of leaving blank areas in his spelling sheet, he filled it with various designs of TIE fighters. Our next installment will look at examples of vintage scrapbooks containing packaging, newspaper clippings and a few surprises. 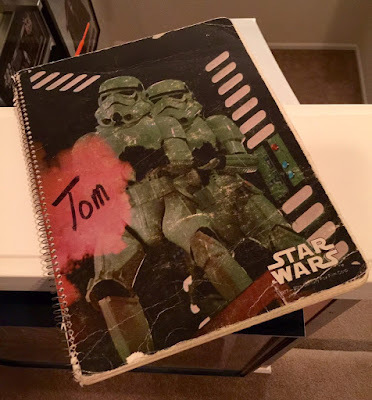 Have some Star Wars homework in your past that you want to share below? It’s an unexpected part two of our July 4th double episode. 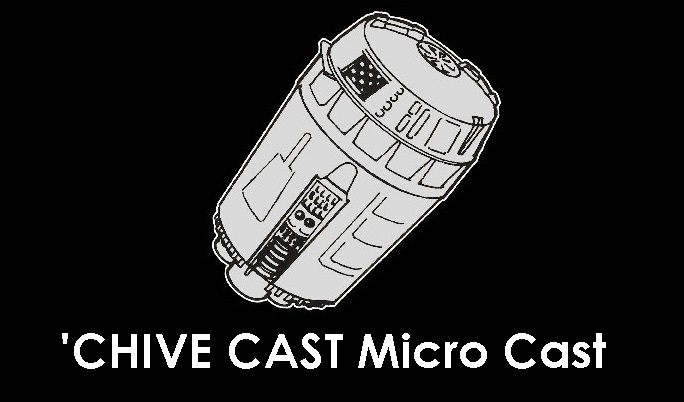 Recorded live from Yehuda’s AT-ATic in Jamaica Queens during an open Star Wars party with Ron Salvatore and Ross Barr. In this half-episode we amend Grandpa Skye’s Facebook rant and the coin production process, we talk about Boba Fett’s 12” torso, Vintage SW sounds, Ross’s Long Fett Header find, Ron tells why unpainted hardcopies are rare, we identify the Palitoy ogre and why they were so cheap, we discuss Judaism with Chulent and Kenner kiddush goblets, Canadian Toy Fair Leia, and Jalapeno Popper Cheese Curls. After only a few hours of sleep and two exhausting days of constant running, standing in lines and general long periods of waiting, I felt the need for a stop at Starbucks to get the morning going. Funny as at this point I had drank more coffee in 48 hours then I had in the previous 48 days. As I headed over to the line queue for Day 3 I had one very focused goal, a goal that I felt was obtainable, a goal that I had to accomplish…getting that damn Gentle Giant C-3PO. Seriously it was starting to become a problem. Frustration had set in after Day 2 and I wasn’t about to let it carry through my third day. Waiting in line for another 4 hours I met another group of fanboys and fangirls. It always amazed me how much diversity there was when it came to why people were attending, and what they were hoping to see. On this day I had a father-son duo that were equally excited about the new Battlefront, a group of Emo kids that were going to get inked, another collector who focused on currently issued collectibles from the original trilogy, and then of course me, a vintage collector focused on finding great deals and meeting people who I had known for years, but never truly met. As the lines started to swell up and close together I had just one thing on my mind: grabbing that big yellow piece of plastic. Much like I do with work or anything in life I tried to visualize my plan of attack prior to the doors opening. I knew the floor like the back of my hand at this point in time and knew the path I would take to get to the Gentle Giant booth. As I approached the doors I took off in a full blown sprint, basically the 200 yard dash with a few obstacles (other fans) and a few turns. As I pulled up to the booth I lined up, and felt good about my position in line. That’s when I found out they were going to do a raffle…really? Now this may not seem like a bad deal if you didn’t just run at top speed across a show floor filled with fans, but I did. Regardless, I took a ticket and heeded the advise to come back at 10:30. Brewing with anticipation I waited to hear them announce the pink tickets would be getting an item today, BOOYA! With pink ticket in hand I strutted up to the check out desk like I just hit a hole in one, while nailing a mid court shot, after winning the lottery. This was it, my moment of Zen! And so concluded a key part of my trip, in retrospect maybe I should have just paid $150 for one of these at a re-sellers booth, but no, this was an experience and a growing pain of being a dire hard fan, in the end it was well worth it. However looking back I had to think, what if I didn’t score it that day? Let’s just say I’m happy I did! The Collecting Track had been hot all week. Lines for every panel were always long, and you needed to be there early to get in. Since they ran back to back with only 30 minutes in between, being in one panel pretty much ensured you weren’t getting into the next one. This is great for the hobby and the collectors that spent their time putting it on, but for someone who truly wants to make it to as many panels as possible it got to be a bit frustrating at times. This was aggravated by the fact that so many people seemed disinterested in the panels and more interested in the Star Tots. This was professed by the number of people I saw reading a book, or playing on their iPads during the panels themselves. The Star Tots were a great idea that started a few years back and given that the Empire figures were the ones being featured at this Celebration demand was high for these. You have to give big kudos to the people that donated to make this possible and those that spent their time designing and creating these mini masterpieces. This would be my first day where I was able to make three of the panels that were being presented and I was pretty stoked that I would get that chance. The first panel was also my favorite of the week. "Great stories of Star Wars Collecting" was a great idea for the seasoned collector and the newbie to the hobby. Covering some of the best stories from collectors over the years it detailed some really key moments in the hobby, my favorite of which was the story of Steve Denny and acquiring the majority of the proofs that are present in the hobby today directly from Kenner HQ. 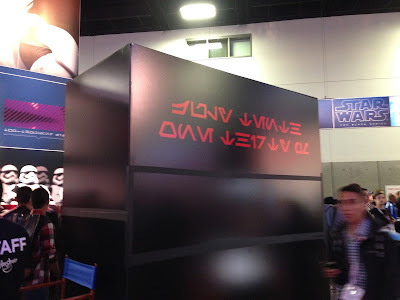 There were some great pictures of the find, a bit of chicken scratch of how many of each film logo were in the find and some images from the initial sale of the proofs which I believe took place at Celebration 2. In addition to the great story of acquiring the proofs from Kenner HQ there was a bit of tragedy in what was my 2nd favorite topic, that being the Blue Harvest scandal. It gave me a lot more detail on what happened exactly, the why and how and of course the blow back on this. What was funny about the whole ordeal is that I had just finished the MarketWatch update for May, and low and behold there was a C-3PO Blue Harvest piece, which despite its origins sold for over $1K. For the first time I was able to leave one panel get in line for the next and actually get inside the hall as well. Star Wars Proofs was something I was looking forward to hear. Mattias Rendahl (author of A New Proof -- a book on proof cards) presented for an hour on the topic. However, I still walked out confused about what the heck a Cromalin really is and why it’s not a proof, anyway I’ll PM him another time and really sort this out in my head. Regardless of walking away confused on some parts Mattias did a very thorough job of talking about 2D pre-production and its place in the hobby today. After spending some quality time on the show floor making a deal for a DT Luke Skywalker, I started to line up to see Skye and Steve put on their show on the podcast stage. With several key contributors to the Archive taking part in the event it was a great way to bridge together some of the people that helped make the Archive what it was, and what it is today all during the 20th anniversary year of the site. The last panel of the day was an interesting one unto itself, "Elite Character Focus Collecting" was a great panel, but nonetheless a little disappointing in some respects. It was difficult for me to discern if the characters were elite or if the collections were elite, but I tried not to let that distract me from the content. Bill McBride, one of the key Darth Vader collectors, did an excellent job covering the gamut of different angles that you could have when focusing on a character in the grand scale of anything that was produced that was related to that character. While on the flip side Skye was very specific to Vintage Star Wars toy collecting and getting as deep as possible into what came out of Kenner, his run of Chewy pre-production pieces is incredibly complete and detailed. Bill Cable's awesome C-3PO collection was featured as well. Overall a really good presentation and one that was well put together given there were three captains of this ship that needed to coordinate a cohesive message. However as I walked out I couldn’t help but think, shouldn’t Chewy have been Ricky and C-3PO be Bubbles -- if you’ve never seen Trailer Park Boys don’t overthink this. As the show closed down for the third day it really stayed opened for collectors. The "Collectors Swap Meet" was something new and fun, especially if you’re more of a casual collecting fan and don’t spend as much time on forums. Unlike the room sales this was actually part of the official agenda for the week, letting a much bigger audience experience person to person trading outside of the show floor. The event itself was a great end to the day. It was packed into a small part of the Convention Center where the Collectors Lounge had been throughout the week. Tables were set up and there was a steady queue through the room. It was a fun way for new collectors to start on their collections, and a lot of left over rarities from the room sales the night before for those seasoned collectors that were still looking for something unique. Saturday night was finally a laid back evening, with the last two nights going until the wee hours of the morning, it was good to chill for a bit. At the Hilton bar I was able to converse with a few other collectors and grab a cocktail. The atmosphere that night was great -- it was calming and refreshing at the same time. Closing out the third day of the event was somewhat bittersweet as I knew that less then 24 hours later that would be it for another two years. After getting in early the night before it wasn’t hard to wake up and get moving at a fairly decent time. This was the shortest day of Celebration with the show-floor closing up at 5:00 that night. Like every other day of the week it started with a long line queue, by now it was starting to become a bit of a joke, repetition in its most innate form. Not waiting nearly as long today I felt a bit more invigorated when I finally hit the show floor. As I quickly made my way upstairs to the Collecting Track, I ran into some new friends Ross Barr and Sean Lehmkuhl. As we got in line we conversed about what we had done the night before and what we expected of the day to come. Sunday is a bit of a quiet day. Most of the big announcements had happened, most of the big panels had already occurred. One thing that remained was a full day of collector panels, and my quick presentation in the Collectors Lounge. With my presentation and laptop in hand it was set up to be a big day for me at Celebration. I started the event for the day with the collectors panel called “Judge me by my size, Do you? The Many Scales of Figures.” This was a really interesting and novel idea. The presentation was well put together and it covered all the figure releases, with the specific focus of talking about scale vs. anything else. Unlike any of the other presentations I had heard of in the past, it was a unique way to look at figures over the years, by size vs. other factors like movie releases, company or era. From the last panel I headed next door to the Collectors Lounge to set up for my presentation. I had gone through a few iterations over the weeks leading up to the event and probably dropped about 10 hours of time into the presentation and reworks to get to the final product finished. I knew that people were busy with a lot of things and there was a Collectors Stage panel going on next door, so I knew attendance would be sparse. However I didn’t personally think that I would present to an empty set of chairs. Although a few people walked through It was really empty and thus I didn’t even spend the entire block of time in the lounge. I had to shake the feeling, so I headed back to the Hilton and ditched my laptop and got my backpack strapped on for some time on the show floor. Strangely the event itself was so important to me that I dropped the feeling of disappointment like a ton of bricks as I slammed my door shut. There was too much fun to be had still to ponder on anything negative. The show closed down at 5:00 this day vs. the normal time of 6:00. Thus there wasn’t a lot of time left to find things and scour for some last minute deals. As I walked the fairly empty show floor I had a lot of time to sit and take in what was left both literally and metaphorically. I did a fun pass on all the aisles that had Vintage for sale making sure I gave each booth another once over before I left. I now had a plan of attack for what I’m going to refer as the witching hour (the last hour of the event) for some speed buying. I attended the last panel I would make it into at the event. "Star Wars Clocks and Watches" was an interesting panel to say the least, due in part to the fact that there was enough content to talk about Star Wars-themed watches and clocks for an hour. As the panel started the presenter had a great line explaining to those in the audience who were born after 1995 what a watch was… It was interesting dialogue given the extent of how many themed pieces came out over the years and the fact that there are many parallels to toy collecting, from the variation factor to the pre-production factor. Vlix – As a collector with the full Droids line I’ve wanted to grab a Vlix for a long time, and of course there were a few available. As I walked over to Order 66 toys I schmoozed up the owner and his cronies as the booth was fairly empty. I knew what I would spend on the piece and I knew that they were miles above where I wanted to be. I used every tactic in the book in about 15 minutes flat to try and pick up the piece, but to no avail, onto the next item. Lili Ledy Squidhead – As an ROTJ collector I’ve always been intrigued by the burgundy cape Bib Fortuna and Squidhead, and as luck would have it Todd Chamberlain had one for sale at the Toy Chamber. Knowing that the show was closing quickly my biggest obstacle here was that his booth was taking cash only for the most part and I needed to convince him to take a credit card. Knowing there were other things I still needed to pick up and that it was priced pretty good for the market I only spent about 5 minutes closing the transaction on my first Lili Ledy figure. ROTJ Proofs – I was shocked by the number of ROTJ proofs that I saw at the show, with most showing up in one seller's both in particular. This seller was one of the toughest I’ve ever run into -- he flat out told me he’d rather take the pieces home vs. take any type of discount on the first day of the show. Thus I knew he was going to be a tough nut to crack. I spent each day talking with him about different parts of his booth, and lightly asked about the two proofs I was looking at a few times to try and plant a seed. With Sunday here and his booth still stocked with proofs I thought he would be ready to deal. But to no avail he was holding his position. I tried everything: the nibble, the bundle, and almost went into begging mode to meet me somewhere half way on what I was looking at. But nothing would work. Thus I had to bite the bullet and take a modest discount on what I thought were high prices to finally pick up two of the last ROTJ proofs I needed: Bossk and IG-88. Green ROTJ Force Lightsaber – The last item I went after was really a last ditch effort to try and pick up something unique that doesn’t come around very often. I had heard that a particular booth with several unique and extremely rare items in its showcase had a mint packaged green lightsaber. Given the guy still had every piece in the case that he started the week out with, I thought he might be open to some offers. However, just like several other sellers, his sky high prices were not negotiable, at the end of the day this was another seller willing to ship their stuff home vs. sell it at the convention. At the end of the day I walked away on Day 4 with some pretty choice pieces for the collection. Nothing out of this world rare, but definitely stuff that is worth some featured space in my display. As the doors to the Anaheim Convention Center closed, there was still one thing to do -- try and get some Star Tots from the unannounced Star Tots grab. There were several left over Star Tots and people lined up to grab them one at a time. I was able to pick up one, but declined waiting a second time, as I had some unfinished business with a seller on the floor. It was a really cool way to end the event as many people were turned away for Gus’s panel where the Boba Fett Tot was handed out, and a large chunk of people were able to pick up that piece, Yoda and some of the other more sought after characters. What, pray tell, did I pick up? An Ugnaught, that’s right. Even though there were many others left, I went after the pig-faced midget from Bespin. Why, you may ask? Because I needed one to go along with the Pugnaught proof card I got on Thursday at the Archive Party, duh…. As security pushed the remaining stragglers out the door the show came to a final close. The feeling was bittersweet... what a great event, what a great time, what great memories and I can’t wait to share them with others in the hobby that didn’t make it out. As I walked back from the Anaheim Convention Center on my way to the Hilton I pondered one question: What was my place in this hobby? 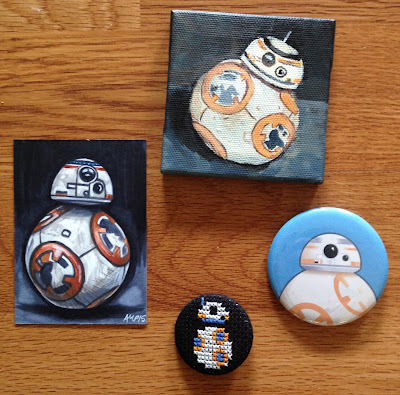 For years I had felt that I was a pretty big Star Wars fan and a fairly astute collector. I walked away with great memories, but with one single thought, “I can’t hang with these guys,” plain and simple. I would compare to how Garth and Wayne felt when they got to hang out with Alice Cooper. I felt so small walking out of the building... not in a bad way, but in a profound way. For years I had one pretty simple goal when it came to the true fruits of my collecting efforts: build the best ROTJ focus collection I could. It was a simple goal, a focused goal, and ultimately one that I felt would bring me the most joy and sense of accomplishment. I use the word accomplishment very deliberately as I interacted with so many that have accomplished so much in the hobby -- writers, innovators, developers and those who just ooze all things Star Wars. It left me feeling invigorated, but also with a somber sense of humility as I realized that my aspirations in this hobby were focused on tangible aspects vs. the intangible aspects such as the community, the philanthropy, and in general giving back in different ways. Thus I left with a much different mindset than I came in with, and one focused on the great fraternity of Star Wars collectors rather than a very introspective view of me and my stuff. I wanted to end this post with a simple thank you to all of those that I was able to interact with and build relationships with over that weekend. There were so many people that have had a positive impact on my collecting experience over the years and it was great to finally have some face time with each other: Jeff Jacobs, Stephen Danley, Skye Paine, James Gallo, Robert Daughtery, The Lehmkuhl Brothers Sean and Ryan, Ross Bar, Ron Salvatore, Tracey Hamilton, Derek Ho, Todd Chamberlain, Josh Burch, Trevor Hopper, Gus Lopez, Duncan Jenkins, Steve York, Martin Thurn, Lee from AFA, Paul Konatske, and so many more. If you’ve never been to a Celebration, I compel you to go (as long as you’re not looking for the same pieces I am in my collection). It’s a trip, it’s a happening, it's Star Wars Celebration, and after it’s 10th installment it shows no sign of slowing down or getting stale. Happy 4th of July, America! Henceforth, Steve and Skye shall return to their usual format! This month has a podcast dedicated to the AT-AT Commander and toys related to him, like the AT-AT itself, the INT-4, and the Rebel Command Center playset. We talk a lot about Sears and about the need to elminiate the term "shrink-wrapped." We talk coins and the coin production process with James Gallo, co-author of Coining a Galaxy. What is a pantograph? You’ll find all this out plus hear a series of long rants against Facebook by Grand Pa Skye and prequel hate from Hipster Snob Steve.